This week Mile End and Victoria Parks are putting lots of spooky activities for a special half term Halloweek! It’s time to get your scare on! Start your Halloween this year by making your own Petrifying Pumpkin! Meet at The Hub Building. Scary spiders, blood-curdling bats and ghastly ghosts! Come and get creative with the Community Park Rangers. Meet at The V&A Building. 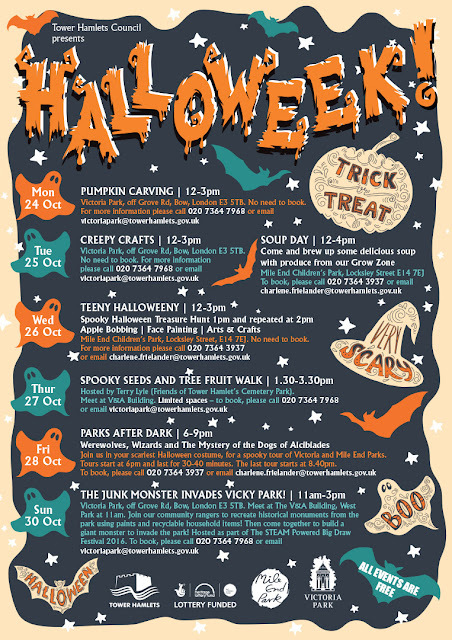 Mile End Children's Park, Locksley Street, E14 7EJ. No need to book. Call 020 7364 3937 or email here for more info. Join Terry Lyle (Friends of Tower Hamlet’s Cemetery Park) on a hunt around the park to find mysterious hidden seeds and fruits. See, taste, learn, collect and eat! The highlight of our Halloweek is a truly terrifying night time tour of the park. Join the park staff for a horrific history stroll meeting werewolf’s, wizards and witches along the way. If you’re lucky, you’ll break the spell of the Dogs of Alcibiades and survive to tell the tale! Join our community rangers to create Vicky Park’s most important historical monuments using recyclable household items and paint – then create a monster to destroy them! Hosted as part of The STEAM Powered Big Draw Festival 2016.